Acker, Kerry. Everything You Need to Know About The Goth Scene. New York: The Rosen Publishing Group, 2000. While there are some styles that tend to identify someone as Goth, I know many goths who were little other than jeans and black t-shirts. I’m personally most comfortable in long skirts and t-shirts. The husband is most comfortable in a complete outfit, styled head to toe, in a manner that will make him stand out. He’s known for it. Neither Jordan or Alek really embrace the fashion of the culture. Jordan does wear primarily black tshirts and jeans, but I can’t tell you that is a conscious decision or for any reason other than it’s what he likes. Alek wears bright colors – basketball shorts and tshirts, or dress shirts and khakis. Ravynn and Whisper like pretty clothes in any color. They do like a lot of black, but they’re little girls so pink and baby blue show up in their choices a lot. 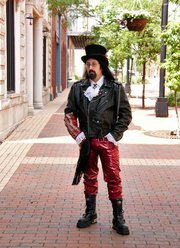 As far as we’re concerned, I believe that whatever in us determines our fashion choices, its’ the same thing that draws us to the Goth culture. Maybe. It’s just a theory. I see so much more than that, but it’s not a bad list. It’s also not bad [although slightly obvious] tha black is the color of choice for goth-minded folks. You’ll notice, though, that Eric isn’t afraid of a splash [or more] of color in his outfits. The author also spends a lot of time discussing the ways that MANY Goths wear their hair or the MANY kids of jewelry MANY of them wear. Really, some experiment with hairstyles and some wear a lot of jewelry. Chapter 5/Gothic Music, Literature, and Film: The main part of the book conclude with lists of popular music, literature, and film. The book is 12 years old, so none of these are current lists. I suggest you Google up the lists or just ask. There is more to be learned from just talking to people than from reading. While the book doesn’t offer wrong information, the way some of it is presented is misleading. Chapter 2/Gothic Philosophy: Sigh. I think the final thought in Chapter 1 would suffice. Acknowledging both the good and bad of human nature and the world in order to fully appreciate both. Then there is a shift to suggesting that Goths focus on the dark and the bad and place emphasis on suffering, sorrow, fear, and death. While I do picnic in cemeteries [we have one scheduled for July 29th – see our Facebook page for details], I don’t focus on any of those things. I don’t mean to suggest that my experience is shared by everyone, but I do mean to suggest that acknowledging the darker things does not necessarily equate to a focus on them. It’s just so different from the experience of “normal” people that it might look like a focus. I don’t know. I’m still trying to figure out the angle of this book. Knowing more about the author than “is a freelance writer” would help a lot. Either they [Kerry could be either male or female] are Goth and trying to honestly explain the culture, but are doing it poorly, or they are not Goth and writing a resource book with a poor understanding of the culture. Even still, maybe an editor made a mess of a perfect book. The world may never know. 3. a system of philosophical doctrine: the philosophy of Spinoza. 4. the critical study of the basic principles and concepts of a particular branch of knowledge, especially with a view to improving or reconstituting them: the philosophy of science. 6. a philosophical attitude, as one of composure and calm in the presence of troubles or annoyances. None of those seem appropriate – at all; however, Dictionary.com defines aesthetic as: having a sense of the beautiful; characterized by a love of beauty. BINGO! The “Who are Goths?” section of this chapter states, “followers of the Goth aesthetic include people of different ages, sensibilites, religions, politics, and careers… Goths are a group of people with broad interests such as history, literature, music, mythology, and fashion.” Good. True. 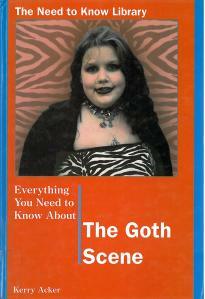 But sadly, the rest of the book attempts to force goths into little boxes in order for it to truly be understood. I’m not sure this is intentional. I suspect the author is attempting to bring light [haha] to the darker aspects and forgets to mention that this isn’t ALL there is. An attraction to darkness can attract people to Goth culture – really, not everyone “gets it,” but we do appreciate the things that non-Goths do as well. This book seems to try to force a separation where one is not necessary and every chapter includes a warning to look for signs for violence and depression. A picture of Dracula [not the one I chose because I’m more of a Christopher Lee fan] holds the caption, “Many Goths are fascinated with the mystery of death and the occult,” BUT MANY ARE NOT. I’m sure that reminder would become annoying and overhelming, but it’s so necessary. Chapter 2/Gothic Lifestyle: An overview of humans in general… A wide range of interests [including music, fashion, other hobbies enjoyed alone or in a group], the opportunity to experiment with sexuality [specifically with gender roles], and interest in different religions [or in no religion, although the focus here is in Paganism and Vampirism, with a note on Christianity]. After reviewing the aspects of the Gothic Lifestyle presented and noting the points made which are 90% pointing out how different Goths are from most of the people in the world, Acker warns us about subscribing to stereotypes. On a recent trip to the library, the girls and I picked out some summer reading books for them and their brothers. They’re not what most people would consider. Jordan wants to teach himself Calculus; Alek wants to review Algebra; Ravynn wants to teach herself Algebra; and Whisper just wants to get ready for 4th grade. With the idea of reading and reviewing some books on Goth culture – just to see what information is being presented to the non-Goth public – I did a quick search while we were there. Being that we live in a town of 56,000, I didn’t expect to find much. I was excited and surprised to find four titles listed. I went to find them. three were available and one has been either lost or stolen [of course, that’s the one I’m most interested in reading]. I’m a working mama with a busy schedule, four kids, a full-time job, and a home business, so I did plan to start with the smallest book. As I pulled out the Everything you Need to Know title, I was tempted to put it right back. My problem with it? Quite simply, the cover. I couldn’t imagine a book that offered that image as the representation of the Goth culture would provide any useful information – and I fully expected to be annoyed with what it did provide. Now, I know the cover model could be a lovely young woman with a charming outlook on life, but when I look at her, I see one thing – ROOTS!! While I try not to overgenarlize or stereotype, Goths are a people typically drawn to beauty and border on the vain. Many of the Goths I know (the husband included) wear their vanity as a badge – that photo doesn’t fly. The Introduction: I had to keep reminding myself that the pub date on the title is 2000 and there is a lot of information that was assumed truth at that date that isn’t so much anymore. The focus of the intro is on the shootings at Columbine High school and how just because those Goths were bad and dangerous doesn’t mean that all of us are. I wanted a reminder that although they were described as Goth by one witness, that it’s not so much true, but it didn’t come. The most helpful bit in the introduction is where Acker writes, “People judge Goths based on their clothing tastes and their appearance, instead of getting to know them by talking with them, hearing their ideas, and trying to find things in common with them.” This is true. I’ve lived it. The introduction also explains why I believe the book failed: It confuses explaining the Goth scene with explaining Goths. Phrases like, “some Goths,” or “many Goths” put me on edge. While explaining what draws some individuals to the culture is helpful and refreshing, explaining the “kinds of people” who are drawn to it isn’t. Chapter 1/The Origins of Goth: Blah, blah, blah. The first half of the chapter focuses on historical Goths and their invasion of Rome. While this is commonly covered in articles on the culture, I fail to see its relevance. What Acker refers to as “Contemporary Goth” is what she means to explain.